Your master narrative is a love story about your organization. It is a brief sixty second verbal introduction that gives an emotional and inspirational overview of your organization or campaign. A strong master narrative is the backbone of a strong case for giving. It all starts with your story. We work with you to craft a case for giving that motivates, informs and inspires your stakeholders and potential donors. We develop clear, concise, compelling and consistent answers to fundamental questions, such as what is the belief that inspires all you do, to what makes you special, to what is your vision for the future and your plan to get there. Our process starts with reviewing your written materials and interviewing key staff and board leaders, surveying stakeholders and facilitating discussion among your leaders to fully understand your story. You can then use the fundraising messaging toolbox that we create to develop collateral, including speeches, brochures, press releases, grant proposals, and more. Are you ready to raise more money? We assess the board’s readiness to undertake a fundraising campaign and their willingness to participate in fundraising activities. We review the staff’s current roles and responsibilities, and assess the time spent on the tasks required to oversee and manage the campaign. We assess your current tracking systems and reporting tools used to manage campaign activity. Who wants to support you? We analyze your past, present and potential donors, and, using a combination of research tools and personal interviews, we identify people who have the capacity, inclination and readiness to make major gifts to your organization. We work with you to decide how much you will ask each potential donor for, when you will ask them, and how you will get to the ask. We help develop an individual strategy for each probable donor, including cultivation and stewardship plans. When it’s essential to know your fundraising capacity, we undertake a fundraising feasibility study that includes confidential interviews with potential major donors. Based on those interviews and other assessments we determine the probability of success for different campaign goals and tell you what you can do to maximize your chances of success. 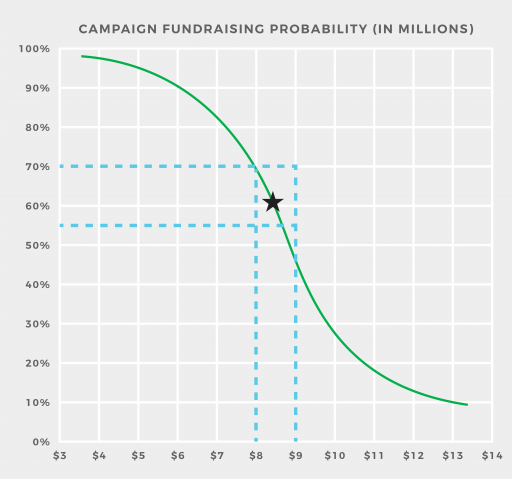 How can you get the best fundraising results? We meet with campaign leaders to chart the course for a successful campaign. We work with you to create a detailed campaign plan, calendar and project timeline. We teach you the steps involved in running a campaign, including: keeping staff and volunteers on task, keeping track of probable donors, preparing for campaign committee meetings and reporting the progress of your campaign. We also provide training and coaching for staff and volunteer ambassadors. From making the introduction, to cultivating and structuring the specific ask, we work together to develop the best strategy for an individual prospect. We provide tracking and reporting tools to help your campaign achieve its goals. We help determine the role staff will play and train them to perform the necessary tasks.